Over the next several weeks, we will serve up 5 key data points we are tracking at the industry level and why they are so important in the digital age. As technology has become a powerful tool for the industry to reach its customers, it can also increase the acquisition costs and lead to an expensive marketplace, challenging a hotel’s bottom line. The first key metric is Guest Paid ADR. Historically, those following the hotel industry have become accustomed to tracking Hotel Collected ADR, which is the traditional ADR measured by hotels. 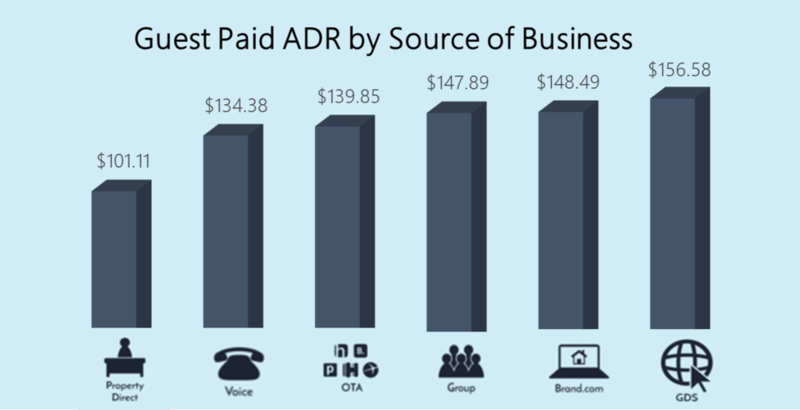 Guest Paid ADR, as the name indicates, is the amount the guest is actually paying for their room night including mark-ups, commissions and channel fees that would not be reported or accounted for in the Hotel Collected ADR figure typically reported throughout the industry. Tracking Guest Paid ADR is important for pricing purposes as well as understanding the full revenue opportunity that exists for each booking, before the commissions and transaction fees that would be charged by distribution partners. It's important to note that new standards have been developed by the Financial Account Standards Board, and the factors that previously determined “gross” or “net” revenue recognition have been changed. The new standard requires the party who is the principal in the sales transaction to record the revenue on a “gross” basis. These new standards go into effect on Jan ‘18 and they will improve the industry's understanding of acquisition costs. These new standards further solidify the importance of routinely tracking acquisition costs as it will improve the industry’s ability to manage these costs and to understand more accurately what guests are paying for their rooms. GDS is the source of business with the HIGHEST Guest Paid ADR $156.58 up 0.8% YOY. In our next segment we will review the importance of profit contribution, a net revenue metric we call COPE %. For the latest updates please subscribe to our blog, and follow Kalibri Labs on Linkedin and Twitter.